Jeremy Jordan is one of the fastest rising stars on Broadway—so fast, in fact, that he has managed to headline back-to-back musicals, Bonnie & Clyde and Newsies, this season. Since making his Broadway debut in Rock of Ages in 2009, the 27-year-old actor has played Tony in West Side Story and debuted on the big screen alongside Dolly Parton and Queen Latifah in Joyful Noise. In the past six months alone, he originated the role of rebellious newsboy Jack Kelly at the Paper Mill Playhouse, opened on Broadway as outlaw Clyde Barrow and returned to Newsies, which begins previews on March 15 at Broadway's Nederlander Theatre. Broadway.com caught up with the ultra-busy actor to discuss his hot role in one of the most anticipated new shows of the spring. 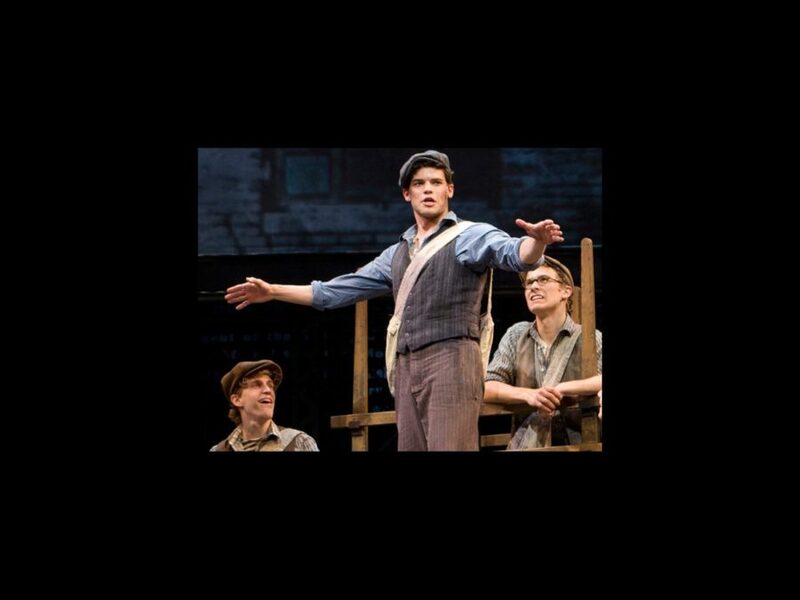 What do you love most about your character, Jack Kelly, in Newsies? I love his charm. He has this great swagger about him—it’s genuine and at the same time it’s totally put on. Why does Newsies work as a stage musical? When you see the movie, you'd think it would instantly work as a stage musical, but it never has. The reason it works now is because we altered the telling of the story a bit and added a romantic element, which I think is very important. The movie had a lot of flaws, and discovering those flaws and eliminating them made it possible to put [Newsies] on stage successfully. What changes have been made since the fall 2011 run at Paper Mill? The dancing has been amped up to the next level. The dancing is going to blow your mind—get ready! Everyone assumes that Newsies will run longer than the announced limited engagement of 101 performances. What do you think? I’m with them. I think it’s going to be a big hit. Once people start to catch wind of this great new show, I think it’s going to run for a while. You’ve done classic musical roles, rock, pop—which style do you feel most comfortable singing? I don’t know. I don’t like putting myself into a singular style. I love all of it. There are different elements in each one that are exciting. In rock music, it’s the screaming; in classical, it’s the beautiful quality; in the country, it’s the riffing; in this, it’s the heart and soul that’s really exciting. What’s the key to making a stage romance believable? Friendship in real life, and trusting someone. The second Laura [Osnes, my costar in Bonnie & Clyde] and I met we became great friends. We found what we connected on, found what made each other laugh and just charmed the pants out of each other. The same thing happened with Kara [Lindsay in Newsies]. So, any thought of going to L.A. to pursue film and TV full-time? What’s your dream career path? After Newsies, I’d like to do another film or TV spot. I’d like to get back into that world. I’m anxious to start growing as a film actor, but I will always come back to Broadway!